For other people named Muslim Magomayev, see Muslim Magomayev (disambiguation). 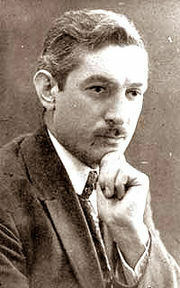 Muslim Mahammad oglu Magomayev (Azerbaijani: Müslüm Maqomayev) (18 September 1885 in Grozny – 28 July 1937 in Nalchik) was Chechen born Azerbaijani composer and conductor. He is the grandfather and a namesake of Azerbaijani opera singer Muslim Magomayev. He was born Abdulmuslim Magomayev into a family of a blacksmith on the same day another prominent Azerbaijani composer Uzeyir Hajibeyov was born. He had studied at a primary school in Grozny before being admitted to the Gori Pedagogical Seminary (in present-day Georgia) in 1900. There Magomayev developed passion for music and conducting. That was also where he first met Uzeyir Hajibeyov, then his fellow student. However Magomayev found musical career financially unpromising and decided to focus on teaching. In 1905, he acquired his teaching certificate at the Tiflis Teachers' College and was appointed a teacher to the village of Bekovichi (now Kizlyar, Republic of North Ossetia–Alania). In 1906, he was voluntarily reappointed to Lankaran (present-day Azerbaijan). In 1911, he received a license that allowed him to teach in high schools and moved to a Baku suburb, Sabunchu. While teaching at a school he took up music and conducting once again. In 1916, Magomayev wrote his first opera entitled Shah Ismayil based on the homonymous Azeri folk epic. Unlike other early Azeri operas, Shah Ismayil was less focused on the ethnic musical component and embodied European opera styles. Magomayev's most major work was Nargiz. Written in 1935, this successful propaganda opera depicts Azerbaijani communists in their fight against the short-lived Azerbaijan Democratic Republic. Overall, Magomayev was the author of 15 musical compositions, mostly rhapsodies. In 1927, together with Hajibeyov, he published The Collection of Azerbaijani Folk Songs; a book where over 300 pieces of folk music had been documented in notes. In 1935 Muslum Magomayev was selected Honoured Arts worker of Azerbaijan SSR. In 1905, Magomayev married Baydigul Jamal Teregulova (whose younger sister Maleyka later married Uzeyir Hajibeyov making the two composers relatives) and fathered two sons. In 1937, he died of tuberculosis while visiting Nalchik (Republic of Kabardino-Balkaria, Russia) and was buried in Baku. The Magomayev Azerbaijan State Philharmonic Society is named after Muslim Magomayev. Muslum Magomayev’s “Shah Ismail” opera has been composed in 1916. The mugham opera composed in 1915-1916 is consist of 6 acts and 7 scenes. Libretto and text were written by composer Mirza Gadir Ismailzade. The premiere of the opera was held on March 7, 1919 in Baku, with a benefit performance of Huseyngulu Sarabski. Muslim Magomayev was conductor and Huseyn Arablinski was director of the opera. Actors were: H.Sarabski - Shah Ismail, M.H.Teregulov - Aslan Shah and Huseynagha Hajibababeyov – Gulzar. ”Nargiz ”– is the second opera by Muslim Magomayev, Azerbaijani composer and Honored Art Worker of the Azerbaijan SSR, written in 1935. Mammed Said Ordubadi is the author of a libretto to the opera. It is considered the most significant composition of Muslim Magomayev. Music of the opera consists of folk songs of Azerbaijan. In 1938, the opera was shown during the Decade of Azerbaijani Arts in Moscow, with the editorship of Reinhold Glière. It is also noted that, the opera narrates about a struggle of Azerbaijani peasants for the Soviet Power. “Nargiz” is the first Azerbaijani opera on a modern theme.